Propyl Alcohol Poisoning is the accidental or intentional intake of any product containing the compound. What is Propyl Alcohol Poisoning? What are the Causes of Propyl Alcohol Poisoning? What are the Signs and Symptoms of Propyl Alcohol Poisoning? The signs and symptoms of Propyl Alcohol Poisoning can vary from one individual to another. It may be mild in some and severe in others. Several systems of the body may be affected. The poisoning may occur due to swallowing the compound, or rarely, due to breathing-in of propyl alcohol compound fumes and vapors. How is First Aid administered for Propyl Alcohol Poisoning? Who should administer First Aid for Propyl Alcohol Poisoning? 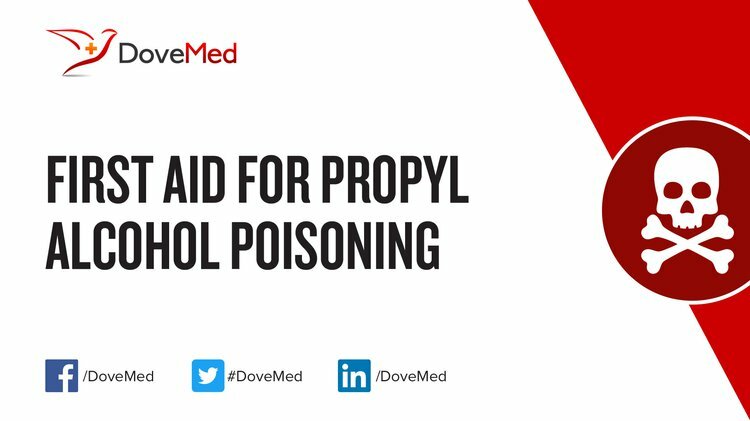 First aid for Propyl Alcohol Poisoning is administered by healthcare professionals. What is the Prognosis of Propyl Alcohol Poisoning? How can Propyl Alcohol Poisoning be Prevented? Rehm, J., Kanteres, F., & Lachenmeier, D. W. (2010). Unrecorded consumption, quality of alcohol and health consequences. Drug and alcohol review, 29(4), 426-436. Godan, A., Gornik, I., & Gašparović, V. (2012). Acute poisoning in Intensive Care Unit. In Croatian International Symposium on Intensive Care Medicine (Vol. 61, No. 2, p. 2). Page, P. N. Ethanol (C2H5OH). Suslo, R., Hańczyc, P., & Drobnik, J. Changes in Hospital Admissions due to Toxic Effects of Alcohols (T51 ICD-10) in the Lower Silesia Region of Poland in the Years 2006-2012 Significant for Emergency Medicine, Medical Intensive Care and Anesthesia. Prakash, S., Kumar, M., Tripathi, B. P., & Shahi, V. K. (2010). Sol–gel derived poly (vinyl alcohol)-3-(2-aminoethylamino) propyl trimethoxysilane: cross-linked organic–inorganic hybrid beads for the removal of Pb (II) from aqueous solution. Chemical Engineering Journal, 162(1), 28-36. ENERGY, S. Ritalin·. Clinical dermatology, 14, 17. Fertel, B. S., Nelson, L. S., & Goldfarb, D. S. (2010). Extracorporeal removal techniques for the poisoned patient: a review for the intensivist. Journal of intensive care medicine, 25(3), 139-148.